Washtenaw County board of commissioners meeting (Sept. 18, 2013): With a third of the nine-member board absent, commissioners dispatched their business in one of the shortest sessions in recent memory, lasting only 45 minutes. The early adjournment elicited a round of applause from staff in attendance – the previous meeting on Sept. 4 had lasted about five hours. Even so, a wide range of resolutions were passed – mostly with no discussion. The absence of three commissioners also led to non-votes on two items originally on the agenda, out of concern that there would not be sufficient support to pass them. During the meeting, the board postponed a final vote on a countywide micro loan program for small business. Under the county board rules, a resolution requires votes from “a majority of the members elected and serving” in order to pass – that is, five votes. Supporters of the resolution weren’t certain they could achieve that number. A resolution regarding the state’s “Stand Your Ground” law had been pulled from the agenda earlier in the day for the same reason. Opponents of the “Stand Your Ground” resolution – which called on the state legislature to repeal the law enacted in 2006 – had been expected to appear at the meeting in force, prompting county administration to add extra security. However, after the resolution was pulled, only a handful of people attended to speak against it, as did one supporter. In another resolution that addressed a statewide issue, commissioners voted to direct staff to explore options – including possible legal action – to help set cleanup criteria in Michigan for the carcinogen 1,4-dioxane. In part, the item relates to a 1,4 dioxane plume stemming from contaminants at the former Gelman Sciences plant, west of Ann Arbor. Dan Smith (R-District 2) stated “present” during that vote, rather than voting for or against the resolution – because board rules do not allow for abstention. After the meeting, corporation counsel Curt Hedger told The Chronicle that he’d be looking at the board rules to determine how Smith’s vote will be recorded. Hedger pointed out that the resolution needed five votes to pass, which it garnered even without Smith’s vote. Commissioners also gave initial approval for a new approach to paying off debt incurred from bonding – typically for public works projects in local municipalities. The proposal would allow local units of government to repay bonds early via the county’s delinquent tax revolving fund (DTRF), which is administered by the county treasurer. The intent is to reduce interest rate payments and the county’s debt burden. In a related resolution, commissioners gave initial approval to restructuring debt held by Bridgewater Township, using this new approach. Several items that received initial approval at the board’s previous meeting on Sept. 4 were passed in a final vote on Sept. 18 with minimal discussion, including: (1) strengthening the county’s affirmative action plan, as well as other nondiscrimination in employment-related policies; (2) authorizing a range of grants administered by the county’s office of community & economic development, as well as a resolution that would give blanket approval in the future to nearly 30 annual entitlement grants received by the county; (3) adding three new full-time jobs for stewardship of the county nature preserves; (4) adding a new 10-bed treatment program for female teens in the county’s youth center that will create a net increase of 5.46 jobs; and (5) budgets for the county’s public health and community support & treatment service (CSTS) departments. And after postponing action on Sept. 4, the board voted to create a 13-member community advisory group to look at options for the county-owned Platt Road site in Ann Arbor. The Sept. 18 resolution was much more general in its direction than the one that was debated on Sept. 4, stripping out most of the details related to a previous focus on affordable housing. Washtenaw County board of commissioners meeting (Sept. 4, 2013): A five-hour meeting was dominated by two debates: funding for a new software system for the Washtenaw County trial court, and the future of county-owned property on Platt Road. For the site at 2260 and 2270 Platt Road – the former juvenile center – staff have proposed a process that focuses on possibly using the site for affordable housing. A $100,000 planning grant is available to explore that option. However, several commissioners – while expressing support for affordable housing in general – wanted to look at a broader range of alternatives, including the possibility of selling the site, which some believe could be worth $2 million. After more than an hour of debate, the board voted to postpone action until its Sept. 18 meeting, directing staff to prepare an alternative resolution to consider. Some commissioners wanted a more formal mechanism to repay the county’s investment in the system, which includes nearly $1.3 million from capital reserves. The board eventually passed a resolution stating that revenues from the court’s electronic filing fees will be used to reimburse the capital reserves. E-filing fees – likely to be $6 per filing – are expected initially to generate only about $45,000 in revenues. The e-filing will start with civil cases, with phased roll-out to other cases, including criminal and probate. At some point, e-filing might become mandatory. A range of other significant action items yielded far less discussion. The board gave initial approval to a new micro loan program for small businesses, to be managed by the Center for Empowerment and Economic Development. Also getting initial approval was a range of grants administered by the county’s office of community & economic development, as well as a resolution that would give blanket approval in the future to nearly 30 annual entitlement grants received by the county totaling an estimated $8.8 million, beginning in 2014. Currently, each of those grants requires separate annual approval by the board. Commissioners also gave initial approval to strengthen the county’s affirmative action plan, as well as other nondiscrimination in employment-related policies. The primary change adds a prohibition of discrimination on the basis of gender identity, gender expression, and sexual orientation. Community activist Jim Toy and Jason Morgan, who serves on the board of the Jim Toy Community Center, spoke during public commentary to support the changes. Other items receiving an initial vote from the board include: (1) adding three new full-time jobs for stewardship of the county nature preserves; (2) adding a new 10-bed treatment program for female teens in the county’s youth center that will create a net increase of 5.46 jobs; and (3) budgets for the county’s public health and community support & treatment service (CSTS) departments. During the meeting, the board also honored the nonprofit Dawn Farm on its 40th anniversary, and recognized Bill McFarlane, the long-time Superior Township supervisor who recently announced his resignation due to health issues. 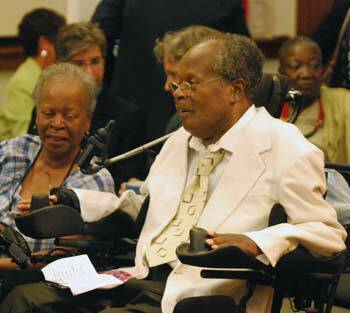 Commissioners also supported renaming the county-owned Head Start building in Ypsilanti in honor of the late Charles Beatty Sr., a pioneer in early childhood education. Topics that emerged during public commentary included a plea to urge state legislators to repeal Michigan’s version of a “stand your ground” law. Board chair Yousef Rabhi indicated his intent to bring forward such a resolution on Sept. 18 – similar to one passed by the Ann Arbor city council on Aug. 8, 2013. Rabhi also plans to introduce a resolution on Sept. 18 advocating for stronger cleanup standards of 1,4 dioxane – the contaminant in an underground plume caused by Pall-Gelman’s Scio Township operations. 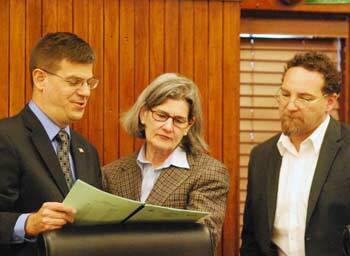 The Ann Arbor city council passed a resolution on Sept. 3, 2013 related to this issue. Washtenaw County board of commissioners meeting (April 17, 2013): Major budget issues were the focus of the April 17 county board meeting, including news that tax revenues in 2013 will be higher than anticipated. Also related to the budget, commissioners gave initial approval to a four-year budget planning cycle, a change from the current two-year cycle that’s been in place since 1994. Voting against the item was Ronnie Peterson (D-District 6). He and other commissioners expressed a range of concerns, including the fact that commissioners are elected every two years and therefore might not be able to contribute adequately to setting budget priorities. Although Peterson remained unconvinced, several commissioners observed that the annual budget affirmation process acted as a fail-safe, allowing the board to make adjustments based on changing priorities. Commissioners also took a final vote officially to dissolve a countywide public transit authority known as the Washtenaw Ride. There was no discussion, but Conan Smith (D-District 9) – a vocal advocate for public transit – cast the sole vote against the resolution. The creation of 39 new jobs and the reclassification of 76 others for Washtenaw County’s community support and treatment service (CSTS) department were authorized by the county board of commissioners at its April 17, 2013 meeting. Initial approval had been given on April 3, 2013. Washtenaw County board of commissioners meeting (April 3, 2013): With a third of the board absent, commissioners were briefed on the county’s 2012 audit – with a look toward changes that will impact future financial statements. The audit was clean. The county’s finance staff, along with the auditor, Mark Kettner of Rehmann, highlighted several points, including a relatively dramatic increase in the general fund balance over the last few years – from $9.7 million in 2009 to $16.8 million at the end of 2012. Kettner also explained upcoming accounting changes that will require unfunded liabilities from the county’s pension and retirement healthcare plans – now totaling nearly $250 million – to be recorded in a different way, with more disclosure. The new accounting changes – required by the Governmental Accounting Standards Board (GASB) – won’t begin until 2015, but commissioner Dan Smith (R-District 2) wondered whether the county could implement the changes sooner. It might be possible, Kettner replied, but “I don’t know why you’d want to do it.” He suggested that the board hold a working session to go over the upcoming changes in more detail. Kettner also pointed out that the changes will affect government entities in different ways. For example, it’s likely that there will be more impact on the city of Ann Arbor, because of how its many “enterprise” funds might be affected and the implications that would have on outstanding bonds. At minimum, the changes will mean more work for finance staff. Also at the April 3 meeting, commissioners voted to add 39 new jobs in the community support and treatment service (CSTS) department, which provides mental health and substance abuse services to county residents. The work is primarily funded by the Washtenaw Community Health Organization, a partnership between the county and the University of Michigan Health System. Most of the new jobs are union positions. Dan Smith expressed concern about adding to the county’s payroll, but supported the resolution along with other commissioners in a unanimous vote. The board also took an initial vote to dissolve The Washtenaw Ride. That Act 196 authority is a remnant of a failed attempt to create a countywide transit system last year. Efforts to expand the current reach of the Ann Arbor Transportation Authority are still underway, but don’t require the structure that was put in place under Act 196. The topic of public transportation was raised later in the meeting as well, as Ronnie Peterson (D-District 6) asked about the county’s role in the southeast regional transit authority (RTA). The RTA was formed by the state legislature last year to coordinate regional transit in the city of Detroit and counties of Wayne, Macomb, Oakland and Washtenaw. There was not uniform support for Washtenaw County to be part of this effort, and it’s not yet clear what the impact will be on the AATA. Also briefly mentioned was a discussion that occurred at a late March county pension commission meeting, raising questions about the new labor contracts that the board approved on March 20, 2013. At issue is whether the county complied with a state law requiring supplemental actuarial analysis before pension benefit changes are adopted. The county administration subsequently conferred with outside legal counsel, and confirmed their view that no new actuarial analysis was necessary. A net gain of 1.7 full-time-equivalent (FTE) positions is part of a proposed 2012-2013 budget for Washtenaw County’s community support & treatment services (CSTS) department. 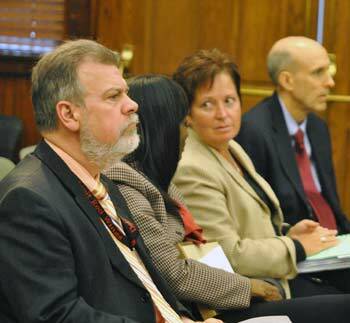 County commissioners approved the CSTS budget at their Sept. 19, 2012 meeting. The CSTS budget runs from Oct. 1 through Sept. 30, in sync with the state’s fiscal year. The county operates on a calendar year cycle. The 2011-2012 budget for Washtenaw County’s community support & treatment services (CSTS) department was approved by county commissioners at their Sept. 21, 2011 meeting. The budget includes a net loss of five full-time-equivalent (FTE) positions. Also acknowledged at the Sept. 21 meeting was the retirement of CSTS executive director Donna Sabourin, who has worked for the county for 20 years. She’s been executive director of CSTS since 2002. 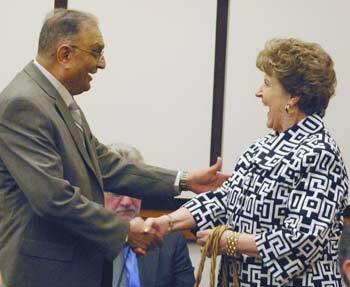 The board approved a resolution of appreciation in her honor at Wednesday’s meeting. At its Aug. 3, 2011 meeting, the Washtenaw County board of commissioners approved a mid-year budget adjustment that increased the general fund budget by $1.42 million. The adjustment also increased the county Community Support and Treatment Services (CSTS) department’s budget by $150,003. The general fund adjustment reflects an increase of $3,476,225 in property tax revenue for 2011, offset by a $1,034,000 shortfall in anticipated expense reductions. The 2011 budget approved by commissioners in late 2010 included the use of $5,289,000 from the county’s fund balance. In light of increased property tax revenues, only $2,921,391 will be used from the fund balance for the current budget year, which ends Dec. 31. The total 2011 general fund budget is $100,696,000.